Hispanic dissatisfaction with the direction of the U.S. has grown markedly in the past year. This pessimism extends across different ages, educational levels and immigrant generations, with Democrats and women reporting some of the highest levels of dissatisfaction in 2018, according to the new Pew Research Center survey of Hispanic adults. Overall, Hispanics are now as dissatisfied as the general public with the nation’s direction, a sharp reversal from previous years. 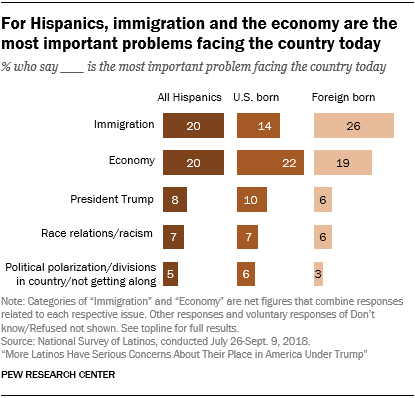 In addition, Hispanics say the economy and immigration are the most important problems facing the nation today, with Donald Trump and racism also cited as pressing issues. Six-in-ten Hispanics (62%) say they are dissatisfied with the way things are going in the country today, up from 50% in 2017. Hispanic dissatisfaction is the highest since 2008 during the Great Recession, when 70% were dissatisfied with the direction of the country. Hispanics have long been more optimistic than the U.S. public on this measure. This changed in 2018. As Hispanics have become more dissatisfied with the direction of the U.S., the general public has become less dissatisfied. In 2018, 61% of the U.S. public was dissatisfied with the country’s direction, down from 68% in 2017. This drop in dissatisfaction coincides with the rising share who say national economic conditions are excellent or good. Hispanic women are significantly more dissatisfied than Hispanic men, 72% to 51%, with the way things are going in the country today. Women have registered a dramatic increase in a single year, with the share dissatisfied jumping up from 54% in 2017 – an increase of 18 percentage points. The share dissatisfied among Hispanic men, by contrast, increased by a more modest 5 percentage points over the same period. As is the case with the general public, Hispanic views on issues vary by political party affiliation. Hispanic Democrats are now more dissatisfied with the nation’s direction than Hispanic Republicans, a reversal from just two years ago. In 2018, seven-in-ten Hispanics who identify with or lean toward the Democratic Party (71%) say they are dissatisfied with the way things are going in the country today, up from 60% in 2017 and 43% in 2016. Levels of dissatisfaction for this group have reached their highest level since the Great Recession and its aftermath. 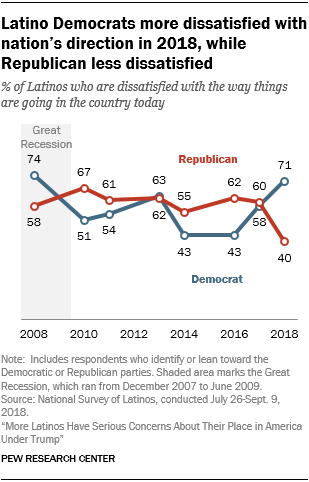 By contrast, less than half of Hispanics who identify with or lean toward the Republican Party (40%) say they are dissatisfied with the way things are going with the country today, down from 60% in 2017. When asked an open-ended question about issues, Hispanics say those related to immigration and the economy are the most important problems facing the country today. One-in-five Hispanics (20%) say issues related to immigration are the most important problem facing the nation, with family separation and deportation among the issues cited. Another 20% of Hispanics say issues related to the economy are the most important problem, with the country’s wealth gap and unemployment among the issues mentioned. Lower shares say President Trump (8%) and race relations or racism (7%) are the nation’s most pressing problems. On immigration issues, more Hispanic immigrants (26%) than U.S.-born Hispanics (14%) cite it as the most important problem facing the country. Among Hispanic immigrants, 31% of non-citizens (a group that counts those with a green card as well as those without one) say the same, compared with 18% of naturalized U.S. citizens. Notably, similar shares of Hispanic Democrats (19%) and Hispanic Republicans (22%) say immigration is the most important problem facing the country. Hispanics broadly agree that the economy is one of the most important problems facing the country today. About a fifth of Hispanics say this across different groups, including gender, political party, immigrant generation and citizenship status among immigrants. When Hispanic registered voters are asked about the nation’s most pressing problem, they cite the same four issues as Hispanics overall: the economy (19%), immigration (16%), racism and discrimination (10%) and Donald Trump (10%). Similar shares of Hispanic registered voters across different groups, including gender, political party, citizenship status among immigrants, cite immigration as the nation’s most important problem.